If you are thinking of taking up embroidery as a hobby or just looking to refresh some of your linens, curtains or household items, you have come to the right place. 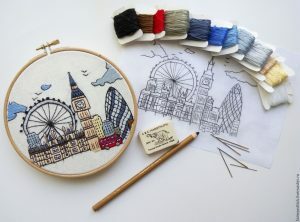 If you have been hesitant or put off from picking up the needle because of the seemingly overwhelming nature and complexity of embroidery, have no fear, it is actually much easier than it seems to start and learn embroidery. A needle; make sure you don’t pick just any needle, you must know that you need an embroidery needle specifically. Thread and/or yarn in the colour or multiple colours of your choosing. A base surface or fabric of your choosing. This could be canvas, silk, linen, or any other fabric that you are comfortable with working with. A design or image. This could be iron on, a printed image, an image that means a lot to you, or a pattern you like. You will also need extra tools such as hoops that will create a more even surface. Now, you are ready to start your embroidery. Transfering an image that you find at a local craft store is a great way to get started. This is an easy way to get comfortable with the tools and materials. This will also help you get comfortable with the various stitches. The easiest stitch to learn and execute is the backstitch whereby the needle is entered from the ‘wrong’ side of the material. The satin stitch is another common stitch that is most frequently used to fill width or shapes. It is a tight stitch. Wool yarn is ideal for canvas and tougher stitches and silk thread is a lighter, almost floss like material for lighter fabrics and surfaces. Practicing with a number of materials, surfaces, and threads will make you a pro in no time.